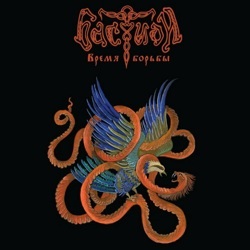 Slavic pagan folk metallers Бастион (Bastion) from Krasnoznamensk of Russia are back with an impressive new album. Formed back in 2002, they released several demos and suffered various line-up changes, before they finally record and release their debut full-length album “Рассвет Сварога” in 2011. In the end of 2013, Bastion return with their second full-length album, entitled “Время Борьбы” released via the Russian label Der Schwarze Tod. If you have listened to their debut album, you will hardly recognize it is the same band! I couldn’t believe my ears with the incredible improvement in their sound. Bastion managed to turn their biggest problem into one of their best elements! Their production is totally professional, with a very powerful sound and a much more aggressive approach. ”Время Борьбы” which translates to “The Time to Fight” includes 8 songs (7 + one no-name song), with a total duration of almost 43 minutes. Their sound is closer now to pagan black metal with epic rhythmic riffs, melodic yet very heavy lead guitars, solid and powerful bass guitars and excellent natural-sounding drums. The band has a very technical sound now and a much more mature and complex songwriting. Their vocals are more brutal now, with expressive pagan metal screams and fewer clean male vocals and choirs. Bastion still use many traditional instruments, with dreamy flutes and epic bagpipes being the most dominant of them, while you will also listen to horns, accordion and violins. Of course there is no comparison with the keyboard-sample quality of their debut album. The band used authentic instruments, which this time sound totally natural, with a very clear and balanced production. Together with the folk scales of the guitars and the Russian language of their lyrics, they add a unique Slavic pagan atmosphere in their compositions. “Время Борьбы“ is a brilliant album that takes Bastion’s music many steps forward, raising it many levels higher. It is even more impressive, when compared to the first album. Fans of Slavic pagan folk black metal shouldn’t miss this. “Время Борьбы” is released by Der Schwarze Tod in a standard jewel-case edition, including a deluxe 28-page booklet, whose central pages unfold into a 24X24cm poster, with an impressive illustration. This central painting, as well as the cover artwork and 3 more illustrations (2-pages each) are painted by Peter Podkolzin, who used a traditional Russian painting technique! The band logo and the front cover illustration are printed in a separate glossy layer, like many other releases of Der Schwarze Tod, a label who pays a lot of attention to the graphics in general! You can visit Bastion’s official profiles below and get a complete taste of their music.